Unfortunately, crawl spaces are hotbeds of moisture growth. Since most crawl spaces have an earthen floor, ground moisture can easily become embedded here – leading to a host of potential problems. Successfully maintaining moisture control under your Terre Haute home can be impossible without the help of a professional – which is where AdvantaClean of W Central Indiana steps in. No matter how difficult to accesses your crawl space is, it’s imperative that it be properly maintained and cleaned – in addition to moisture-related problems, crawl spaces act as ripe breeding grounds for insects, rodents, and the spread of harmful bacteria. Improper grading, a lack of gutters, and insufficient crawlspace ventilation are all triggers for moisture and mold growth in this area of your Terre Haute home or workplace – AdvantaClean can help you enact install these corrective measures for the future, and successfully eliminate existing mold growth. Crawlspace Inspection and Cleaning. 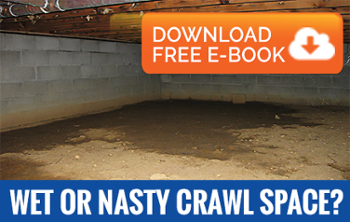 It’s crucial that you clean and thoroughly inspect your crawlspace on a regular basis. Not exactly up for crawling around under your property to do so? It’s time to call in the professionals! Here at AdvantaClean, our Terre Haute team of experts is highly skilled in safe crawlspace access, cleaning techniques, and inspection procedures. We provide a wide range of services in this area, all of which are integral in the fight against crawlspace moisture growth. Crawl space Weatherproofing. If your Terre Haute home or workplace has improper crawl space ventilation, this can result in potentially harmful surface condensation – luckily, AdvantaClean’s services include weatherproofing specifically for your crawlspace. Weatherproofing this area will help keep your Terre Haute home or business safely sealed from the elements, while maintaining proper ventilation. Crawl space Encapsulation. Crawl space encapsulation entails properly insulating your Terre Haute foundation walls and sealing your crawlspace vents from the elements – this will help ensure that your Terre Haute commercial or residential property stays safe, clean, and dry. Crawl space Dehumidifiers. In crawl spaces with severe excess moisture, crawlspace dehumidifiers systems can help to successfully remove excess moisture from the air. Do you have crawlspace moisture issues? It’s time to call AdvantaClean today! AdvantaClean of W Central Indiana employs a team of highly-trained experts in issues related to crawlspace moisture and mold growth. We’ll effectively treat your crawlspace for excess moisture today, and help you enact proper corrective measures for the future!